DAVOS/SWITZERLAND, 23JAN14 - Impression of the audience during the session 'The Millennial Challenge' at the Annual Meeting 2014 of the World Economic Forum at the congress centre in Davos, January 23, 2014. Photo RÈmy Steinegger. 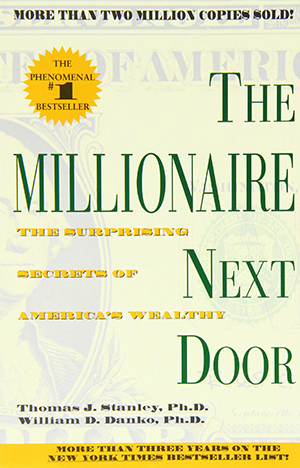 Back in 1996 when Thomas J. Stanley and William D. Danko first published The Millionaire Next Door: The Surprising Secrets of America's Wealthy, the times were very different. The DJIA was at 6,000 and racing toward 10,000. A web was something a spider created. There were no smartphones or social media in the hands of literally everyone. More to the point, there were no dot-com millionaires or billionaires. The self-made millionaires Stanley and Danko found were doctors, lawyers, engineers and other well-compensated professionals; or they were hard-working technicians and craftspeople who started their own businesses and worked 100 hours a week or more. Stanley and Danko identified several common characteristics of people who successfully built wealth, which included working hard, living below their means and prioritizing financial independence over displays of social status. Typically, their adult children were economically self-sufficient. To be sure, even in Stanley and Danko’s time there were many among the ultra-wealthy who did not fit this exact mold. These were largely people who inherited their wealth, rather than building it themselves. Those changes are illustrated in part by U.S. Trust’s 2016 “Insights on Wealth and Worth,” a survey of 684 people in the US with investable assets of more than $3 million; respondents were 13% millennials; 24% Gen Xers; 42% baby boomers and 21% age 72 or older. The wealthy of 2016 are younger, more diverse and more global. Many of them earned their wealth on their own, in the digital revolution, through a combination of pluck and luck. Yet they are more likely than older millionaires to have inherited a goodly portion. Millennials surveyed by US Trust said that about half of their wealth came from earned income, roughly the same proportion as both Gen X and boomers. However, these HNW millennials attributed 20% of their wealth to inheritance, in contrast to only 10% for Gen X and 8% for boomers. The study also found millenial respondents more likely to have grown up wealthy (45%) than Gen X millionaires (28%) or Boomer millionaires (18%). In these different times, it is no surprise that millenial millionaires—whether self-made or inherited—have absorbed a different set of lessons around work, value and thrift than those frugal doctors and entrepreneurs of yore. When asked which family values were stressed while they were growing up, 75% of the Boomer millionaires and 60% of Gen X millionaires pointed to “financial discipline,” while this value was emphasized by just 39% of rich millennials. Yet millennials have started saving money at a much earlier age. The Transamerica Center for Retirement Studies found that 71% of millennials eligible for a 401(k) plan participate and that 70% of millennials began saving for retirement at an average age of 22. By way of comparison, boomers started saving at an average age of 35. Thrifty though not frugal, “affluent millennials will pay a premium for their trip to Africa but are smart enough to still shop Sam’s Club or use Groupon for a good deal on products they need every day,” explains Jeff Fromm, of the advertising agency Barkley US. Stanley and Danko would have a hard time classifying today’s millennial “millionaires next door.” Some are serial digital entrepreneurs while others are jet setters traveling the world. Some are using their wealth for philanthropy or social good. Many are continuing to grow the family business. Some are still pursuing higher education in order to make their mark in the world, but many are forgoing education to get started in newly emergent industries, from the internet to biotech. That’s not so very unusual in wealthy entrepreneurs. Bill Gates and Mark Zuckerberg both dropped out of Harvard; Larry Ellison quit the University of Chicago and University of Illinois, Christy Walton never attended college at all. Other high-profile wealthy dropouts include Sheldon Adelson (City College of New York), Michael Dell (University of Texas) and Paul Allen (Washington State University). The list goes on. * Though the exact dates vary on who is considered a millennial, it generally refers to people who came of age around the millennium. Born between 1977 and 1994, give or take a year or two in either direction, these millennials—also called Generation Y, Echo Boomers or the Net Generation—were still at an age roughly between toddling and voting in 1996.